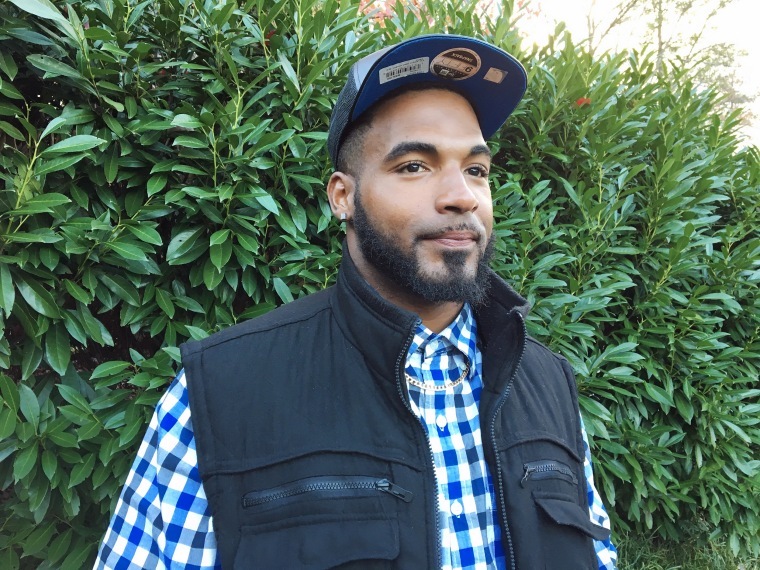 CHARLOTTESVILLE, Va. — Four months after a 20-year-old man drove his car into a crowd in Charlottesville, Virginia, killing one person and injuring 19 others, Marcus Martin is still healing. On this chilly, fall day in Charlottesville, Martin, 27, said his leg is stiff because of the cold weather and occasionally hurts when he walks on it. He got an aircast boot taken off his left leg last month, a result from the surgery he underwent for a broken ankle, twisted tibia bone, and destroyed ligaments. Wearing tennis shoes, he walks with a slight limp, but hopes physical therapy will strengthen his leg. He tucks his hands in the pockets of his vest and sighs deeply, emotional as he discusses the day of Aug. 12, when James Alex Fields, Jr. barreled his Dodge Challenger down the street, striking him as he pushed his fiancée Marissa Blair out of the way and hitting their friend Heather Heyer, who died from her injuries. He said every day is progress, and as his body continues to strengthen with each day, emotionally and mentally he is trying to move forward. Traumatized by the violent acts, he has PTSD and said he jumps whenever he hears tires screech. He talks with a therapist to get out all of his emotions and said it is helping him cope. He said the experience for Blair has been an emotional roller coaster and she is constantly reminded of what happened to her friend because she walks the same street where the incident occurred on her way to work. "She still just breaks down crying. All I can do is just be there and help her. I knew Heather, but their relationship was much deeper," he said. Prior to the attack, Martin was getting his life back on track after serving five years in prison for robbery. He was working as a maintenance worker at a hotel and for a landscaping business. Nowadays, he stays at home watching the show with his same name, "Martin," going over his cousins' house, and spends time with his five-year-old daughter. He said he receives mixed reactions over what happened. Some people in Charlottesville see him as a hero and praise him for what he did; other people back in his hometown of Shipman, Virginia criticize him, saying he is using the event to get rich and famous. He has also received support from the community, with over $61,000 raised on GoFundMe that helped pay for his medical bills. A young African-American boy at the mall, he recalled, approached him and asked him if he was the person with their feet in the air in the infamous photo taken the moment the car struck the crowd. The rally in Charlottesville sparked a nationwide debate around Confederate monuments and symbolism, with cities such as Baltimore and Dallas removing statues of Confederate leaders Gen. Robert E. Lee and others. Martin said the monuments should be placed in their own museums. “If you care so much about them [monuments], make a memorial about the Confederacy, let them have it. If it has so much meaning to all of you white supremacists, y'all put your money together and build a memorial and put your statues in it if it means that much to you," he said. Martin thinks the city of Charlottesville could have done more to prevent the violence that took place and stop the rally from happening all together. A report released earlier this month found a "great number of failures in both planning and execution" that contributed to the violent events that happened that day. “He needs to get out of office. If you’re talking about ‘Making America Great Again’ what are you doing?" Martin said. "All you’re trying to do is bring back history and make America great in your own way, where you can give the white man the upper hand. That’s all you’re trying to do." He said this incident in Charlottesville has helped him see the bigger picture of life, motivates him to create a better future for his daughter, and encourages him to be a mentor to at-risk youth. As people gather and spend the holidays with their loved ones, Martin is thankful to be alive, but thinks of those who won’t be able to spend time with their family.